So I’ve always loved the underground, even as a child: going down into the dark places in the earth and coming out again a slightly different person felt natural, felt correct. I loved mines and I loved subways and tunnels dug underneath water — and I have also always loved the abandoned. If I had any guts at all, and the potential consequences were not so dire, I would absolutely be urbexing all over the damn place; as it is I have to look longingly at derelict and fascinating structures and wonder what’s inside. There are some places underground that are well-known to people like me as a kind of prize achievement, something longed-for, a wonderful addition to a collection. The deep-level shelters under certain London Underground stations, for example: I still hold out hope that just maybe I’ll be able to see inside one myself, after having spent so long writing about horrors hiding in those tunnels and shafts. It’s much, much easier to visit the Paris catacombs, and that I plan to do when I eventually make enough money and time to go back to France for a holiday. 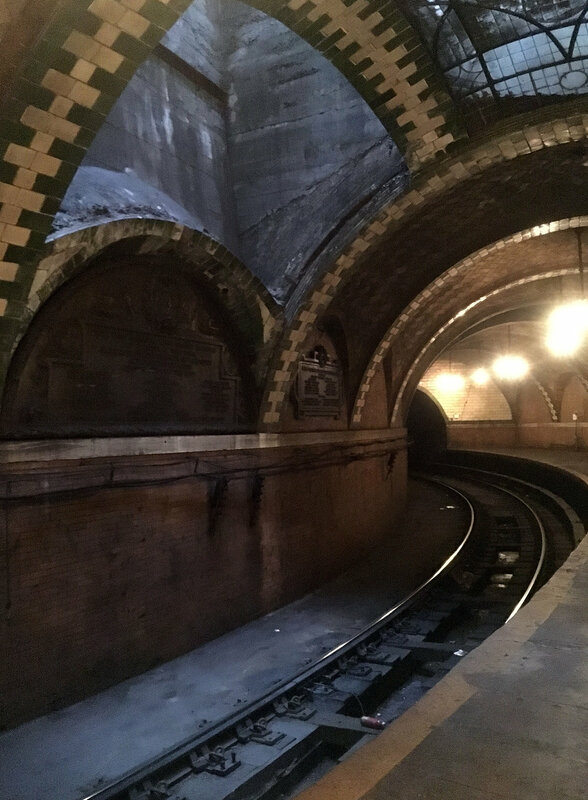 But the crown jewel of underground exploration in New York is the old City Hall subway station, and today I got to go down there and omg omg omg. You can look up the history of City Hall at the New York Museum of Transit; ground was broken in 1900 and the city’s first subway train departed City Hall station in 1904. It was closed at the end of 1945 for several reasons, one of them being that the longer trains of the latter day had trouble navigating the tight radius of the City Hall loop. It’s still used as a turnaround for the 6, and while we were there several trains squealed and shrieked their way around the curve — some of them containing passengers staring in awe, or possibly just surprise. The tour we took is arranged through the museum, and you have to sign up several months in advance and cross your fingers you got there before the list was full. It was fantastic. I’ve been on countless guided tours of various stately homes or ancient fortresses and this was one of the best I can remember; our guide was not only incredibly informative but also wry and funny and engaging, and obviously loved her job. She told us all about the first underground attempt at people-moving, Alfred Beach’s Pneumatic Transit, which never got anywhere beyond a demonstration tunnel with a car shuttling back and forth — I’ve researched it myself, to some considerable extent, because I’ve been fascinated with the Beach project ever since I first encountered it in Ghostbusters II. Remember the abandoned Van Horne station Ray finds under the street, the one containing a river of shimmery pink psychomagnetheric slime? That’s a conflation of the Beach Pneumatic Transit and City Hall station, and the Ghostbusters fan in me as well as the underground history enthusiast was internally jumping up and down and yelling in glee. I’ve put a few photos up of the station and the wonderful undulating arches of the City Hall entrance to the Brooklyn Bridge station, which is where we emerged. I fell in love with the city pretty much the first night I spent in it with my future wife, and I keep falling. Every time I come here it’s like being accepted into a huge, vast, incredibly complex living thing, a corpuscle in some unknowable circulatory system, and the more I see of it the more I love it. Visiting this station was an enormous gift, and I’m so grateful — and also still so goddamn stoked I GOT TO SEE THE GHOSTBUSTERS STATION AAAAH. Nobody ever accused me of dignity, after all.